ProX XT-HERCULES 6.5 PLUS Fexix® Rigging tower Frontal loading lifting tower allows to raise the load from the floor, avoiding any single effort and specially designed for a reliable lifting of Line Array Systems of up to 500kg/1102 lbs to a maximum height of 6.5 meters / 21.30 Ft. This product is perfect to fly line array systems, trusses and LED screens. 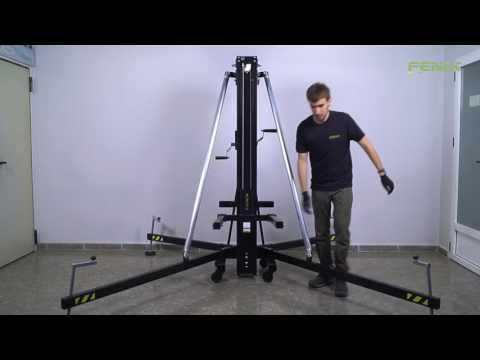 The compact design with castors gives the XT-HERCULES 6.5 PLUS Rigging tower easy handling and maneuverability, reducing storage space and it is the ideal solution for touring, rental and event production (concerts, events, trade fair stands, stage construction, fitting-out discos, theaters, broadcasting, TV, etc.). These stacking trusses, manufactured with extruded aluminum (Alloy: EN-AW according to 6082 T6) and TIG welded (continuous cord for a maximum resistance), are specially designed to be piled up, reducing storage space and making it easier to handle. All HERCULES towers lift the load from the floor and are height adjustable. SAFETY At FENIX Stage, we are committed to products and people's safety. To guarantee the maximum security, our products are designed, manufactured and tested by qualified engineers at each stage of the manufacturing process. All FENIX products are manufactured with materials that offer high resistance, reliability and security.